Last Sunday, plenty of Westporters went for runs. Some jogged lightly. Others put in a few hard miles. Even with hills, the terrain was fairly easy. 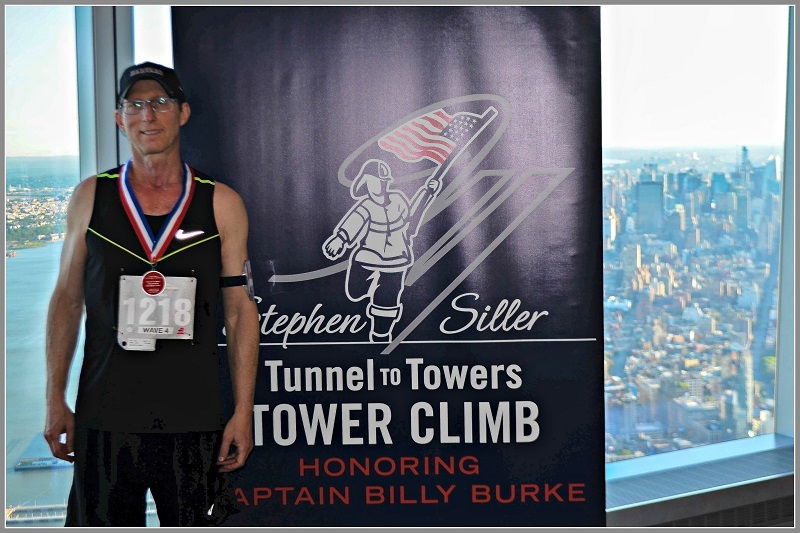 The longtime Westport businessman — who earlier climbed the Himalayas — spent Sunday racing up the Freedom Tower (1 World Trade Center). That’s 102 floors. 2,250 steps. Straight uphill. Schachne’s run was part of the “Tunnel to Towers” Climb. The event paid homage to — and raised funds in honor of — 1st responders killed on 9/11. Among them: firefighters Stephen Siller (the namesake of this foundation) and Billy Burke (who gave his life to save someone in a wheelchair). Of the 665 racers on Sunday, Schachne was the 2nd highest individual fundraiser. With help from many Westporters, he raised nearly $6,000. Runners were not allowed to bring or carry anything into the building: no watches, cell phones, cameras, GoPros — not even keys. All gear was deposited in a truck, prior to 3 security checks. Schachne was in the 4th wave (of 7). The 1st group took off at 5 a.m. He got into the tower at 6 a.m., with more than 100 others. 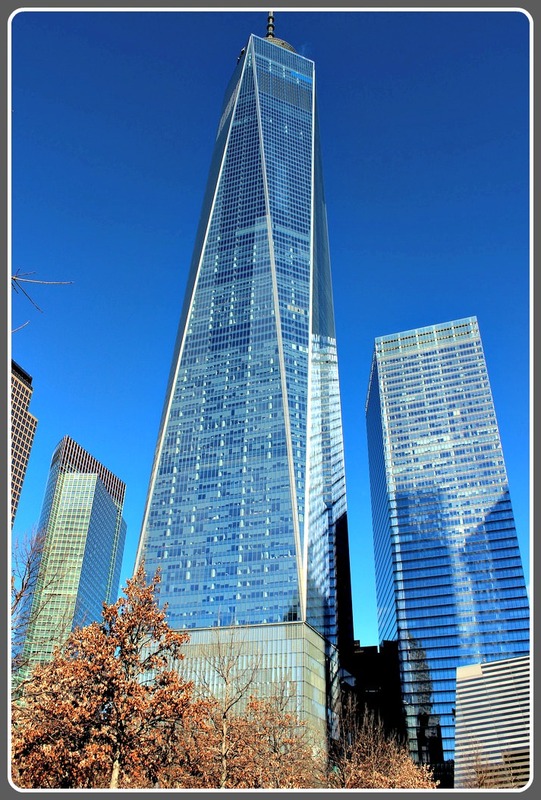 1 World Trade Center (“Freedom Tower”) is the tallest skyscraper in the Western Hemisphere, 4th tallest in the world. Schachne planned to double-step the entire way up. Yet after standing outside for 15 minutes in cold air, his airway had constricted. He has asthma, but had forgotten his inhaler. Fortunately, a few minutes inside the warm building acclimated his body. Just around then though, his heartbeat spiked. Without a watch or phone, Schachne had no idea how long he’d been climbing. He did not look at floor numbers, not wanting to get discouraged. But after a while, thinking he was halfway up, he checked. He read with dismay: 27. He realized he would not hit his 23:30 goal. But he slogged on, step after step after step. As he neared the top, the stairwell grew congested. He continued to 2-step, weaving to the left and right of crowds. Finally — 2,250 steps and 26:11 after he began — Schachne reached the top. It had been much harder than he’d anticipated. David Schachne, on the observation deck at the top the Freedom Tower. Considering the extra stairs, he was satisfied. When he calculated his time against his Empire State run, he figured he beat that previous pace by 20 seconds. 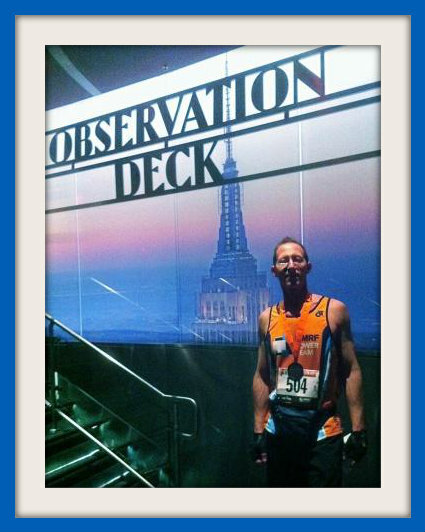 At the finish line — the observation deck — he was awed by the views. He gazed out at the Statue of Liberty, and much of New Jersey and Manhattan. “It was an amazing morning,” Schachne says. “The Freedom Tower is truly a sight to behold. The event raised over $300,000 for catastrophically injured servicemen and women, and 1st responders’ families. I am honored to have helped, and I thank all who supported me. And how was your Sunday morning run? 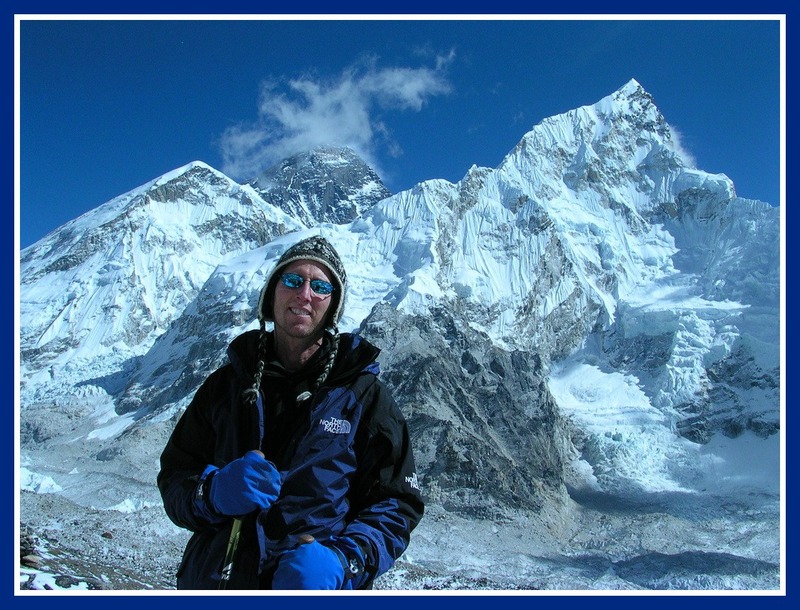 In November 2004, David Schachne set out to climb Kala Patthar. At 18,192 feet above sea level, it offers an amazing view of Mount Everest. Born and raised in Brooklyn, Schachne camped and hiked in the Catskills and Adirondacks. The Himalayas beckoned — as a physical challenge, and for emotional fulfillment. Schachne moved to Westport in 1996. He loved writing but — having earned an MBA at Harvard — he spent his time on business proposals, not manuscripts. After 9/11, he decided to pursue his passions. He wrote and hiked more extensively. Three years later, he headed to the Himalayas. David Schachne, fulfilling his dream. Continuously dodging bull-dozing yaks to prevent from being gored was the least of his worries. Climbing for hours and hours each day while mentally and physically exhausted; confronting constant sub-freezing temperatures; dealing with illness, high altitude sickness, piercing headaches, wretched odors, utter filth, bacterial infections, dysentery and more, he endured 2 weeks of pure, nightmarish misery. But Schachne got something out of his attempt — beyond fulfillment. 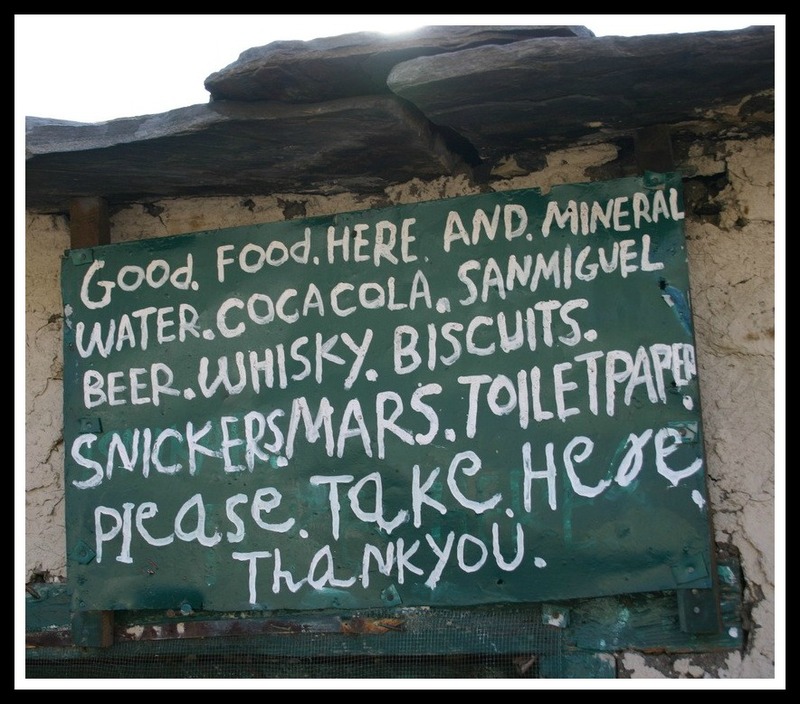 All the essentials, near the base. It’s quite a read. Whether you plan your own assault on Kala Patthar, or just plan to live Schachne’s trek vicariously, curled up with a Nook on your sofa. 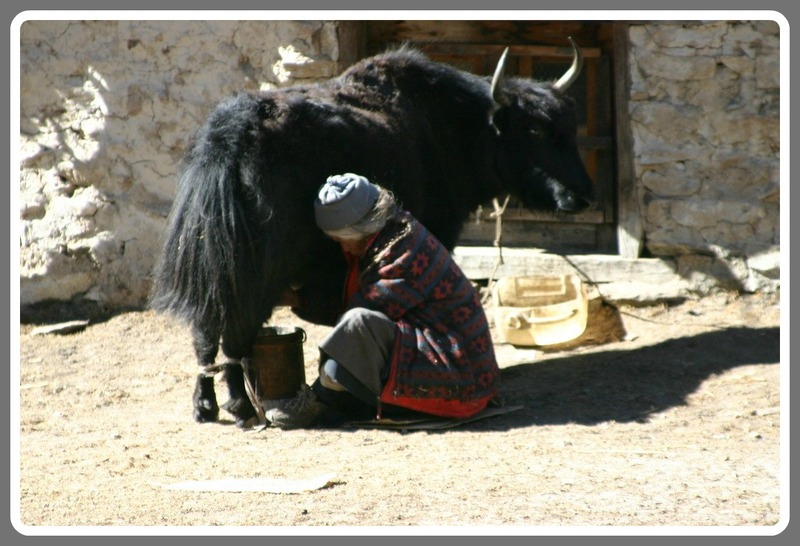 Milking a yak in the Himalayas. Some people run for office. Others run out for a quart of milk. 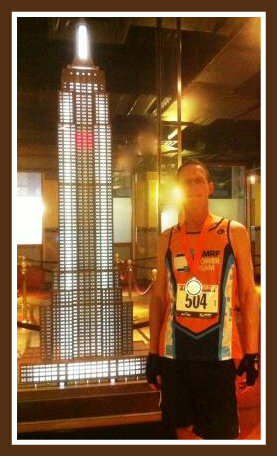 David Schachne ran up the Empire State Building. That’s right. 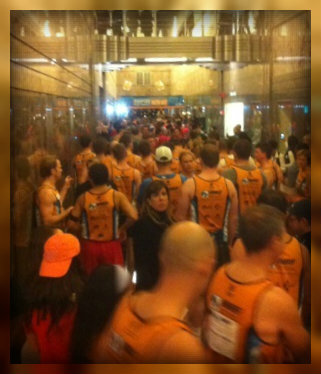 The Westporter ran up 86 floors. All 1,576 steps. In a stairwell only 44 inches wide. And he did it for a cause even better than a great heart rate, and bragging rights in any yeah-well-the-weirdest-thing-I-ever-did conversation. David raised $7,525 for the Multiple Myeloma Research Foundation. David Schachne, with a model of the Empire State Building. The actual building is somewhat taller. The event was last week’s Empire State Building Run Up. The 37th annual race — sponsored by New York Road Runners as an MMRF benefit — is almost as hard to get into as it is to complete. Just over 700 made the cut, from thousands of applicants. They came from 26 states, and 25 countries. The youngest runner was 20 years old. The oldest: 78. So there was David last Wednesday night. From 8 to 8:30, batches of elite athletes were released. He was not among them. Those runners clawed their way through a standard-sized doorway, to reach the stairwell. Then, for the next hour or so, the rest of the pack was released, 1 at a time, every 6 or 8 seconds. The last was a firefighter from North Carolina. He climbed with 55 pounds of gear. David had no idea if his goal was realistic. He’d trained in a building with only 43 floors — so he had to do 2 sets to replicate the Empire State. He ran 8 minutes on those 1st sets, training every other day for 2 months. After taking the elevator down to the ground floor, his 2nd sets were 9 minutes. The crowded scene at the start of the Empire State Building Run Up. As David jockeyed for a good starting position, on his left was a guy from Australia. On his right, a woman shook with nerves. For good reason: She’d never practiced in an actual building. She figured a Stairmaster was fine. Shortly after 8:30, David was released into the “stairhell.” That is not a typo. He took the 1st 10 floors at a good, steady, 2-step pace. By the 20th floor he felt tired. That was his 1st water break, as the layout changed from zigzagged to stacked flights. The stairwell was incredibly hot. The dry air burned his throat. The next 44 flights were killers. Each was more difficult than the previous one. He 2-stepped all the way to the 64th floor, where his legs felt like rubber. It was too difficult to speak. All requests to pass runners were done with hand signals. By the 76th floor, he says, his heart was working harder than it ever had. He willed himself to go on. When he saw the sign for the 80th floor, David felt elated. But the feeling was short-lived. There were still 6 flights to go. With his throat and lungs burning, and his heart beating through his chest, he slogged upward. He counted down each flight. Finally, David hit the 86th floor. He entered the outdoor Observation Deck. The cold blast slammed into him. But he still was not finished. The finish line was on the other side. Mustering every last bit of effort, David crossed the finish line. His time: 19 minutes, 14 seconds. That placed him 289th overall. He was smack in the middle of the entire pack. But he’s #1 on our list of Westporters Accomplishing Amazing Feats That Make The Rest Of Us Look Like Lazy, Worthless Slugs.